Being a scientist is sort of like a form of original sin in horror movies. Linda Wade inherited that sin from her parents in the form of a very sinister artifact. For years, she tried to protect her own family, but when her well-meaning husband starts snooping into her past, he stirs up a ferociously powerful force in Nathan Hendrickson’s The Hollow One (trailer here), which screens during this year’s Toronto After Dark. Michael Wade had two daughters with Linda, but he literally did not know the first thing about her past. You might think he would figure she had her reasons, but instead he hires a private detective at the urging of his youngest, Anna. What he gets is a manila envelope full of field notes and a pepper grinder from Hell. It seems Linda’s medallion fits rather snuggly in the artifact. Unfortunately, Wade will not have much time to peruse the material before dark malicious figures start tormenting him. At least the Wade sisters were not around when darkness fell over their home. Linda Wade tries to contain the damage, but to no avail. Ironically, she will be fatally injured when she dashes in front of Matt Hoffman’s car. He and Rachel Wade were a heavy item, but she refuses to forgive him for her mother’s death. However, the tragedy leads the Wade sisters away from the rural Washington State town for several years. When they finally return, they find the place a veritable ghost town. What few zombie-like people remain, including their apparently deranged father, have bizarre, ancient metal disks affixed to the back of their necks. To get to the bottom of it all, they will have to work with Hoffman, who was just finished serving his sentence for the accident. Although Hollow has not played a lot of the big genre fests, it is one of the scariest films currently in circulation. The ominous forces threatening the Wades are not merely malicious. They are malevolent in a greater, metaphysical kind of way. Probably the last horror film that dared to suggest an equivalently big, evil picture was H.P. Mendoza’s I am a Ghost. While the implications of Hollow are massively unsettling, the execution is also wickedly effective. Hendrickson’s macabre visuals and the Exorcist­-esque sound design are profoundly unsettling. Honest to gosh, if this film does not give you the heebie-jeebies than you must have absolute nerves of steel. Still, it is not quite the pinnacle of perfection. Hendrickson often resorts to glaring contrivances for the sake of advancing his narrative. Frankly, there are a few “oh, c’mon” moments in there. Still, we can forgive such micro shortcomings, because the macro whole is so blasted creepy. When the sisters and Hoffman start investigating the wreckage of their former home, detail after little detail will just set you on edge. Production designer Lisa B. Hammond and her team did terrific work crafting the distinctive look of the film. The cast is also uniformly consistent and credible. It should also be noted how much Tonya Skoog and Kate Alden’s Rachel Wade look like mother and daughter. A lot of scary things have come out of Washington State, like Microsoft, so it is nice to see one that is frightening in a good way. Hendrickson’s film will truly get into your head and under your skin. 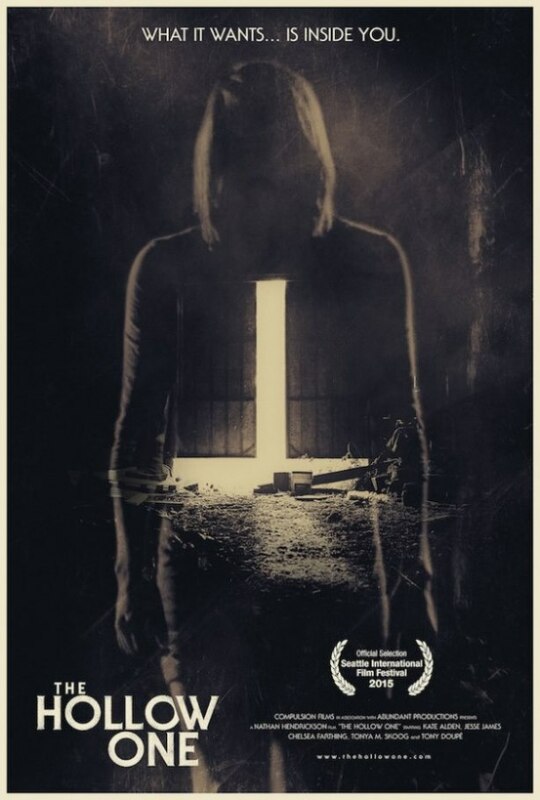 Therefore highly recommended for horror fans, The Hollow One screens this Sunday (10/18) as part of the 2015 Toronto After Dark.